Doctors treating Rabbi Ovadia Yosef have placed him in an induced sleep as they work to stabilize his failing condition. 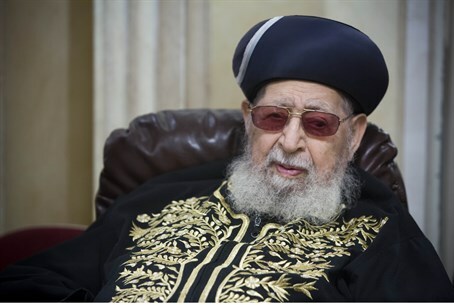 Rabbi Haim Ovadia Yosef has been put into an induced sleep and is being aided by a breathing respirator as the team of doctors treating him say they are "fighting for his life." The update from Hadassah Ein Kerem hospital in Jerusalem came this afternoon from Professor Yaakov Naparstek who said, "The situation is very grave, but we don't see an immediate threat to the Rabbi's life." Rabbi Ovadia Yosef's sons and Shas Head Aryeh Deri are said to be reciting prayers at his bedside. Earlier today, Shas MK Eli Yishai called on Israelis to pray for the recovery of the party's spiritual head and leading Sephardic scholar Rabbi Ovadia Yosef (Ovadia Haim ben Georgia). He made the call following an emotional visit to the bedside of the ailing rabbi. Rabbi Yosef was hospitalized after undergoing surgery to implant a pacemaker on Sunday. That operation went well, but the next day, following successful dialysis treatment, his condition rapidly deteriorated after doctors discovered fluid in his lungs. He was put on a respirator and although his condition was downgraded to serious but stable, a further deterioration led doctors to induce a deep sleep and connect the rabbi to a respirator. In an interview with Kol Rama radio, Shas MK Eli Yishai, who is a close confidant of the rabbi, described his feelings of sadness at seeing his poor health during a hospital visit Tuesday. "It is very difficult to see him like that. Right now his condition is stable but difficult," he said. A tearful Yishai said it was particularly hard for him to see Rabbi Yosef in such poor health as he "is like a father to me." MK Yishai called Rabbi Yosef an outstanding leader and an huge inspiration, and said that despite his sadness he was inspired to see so many Jews - young and old, religious and secular alike - join together to pray for him. In contrast to reports this morning that Rabbi Yosef's condition had improved slightly, the hospital has released a statement saying that his condition is still very serious, though relatively stable at the moment. As is customary in cases of life-threatening illnesses, the name "Haim" (meaning "life" in Hebrew) has been added to Rabbi Yosef's name, and his family have asked people to continue praying for Ovadia Haim ben Georgia. Meanwhile the kollel (Torah academy) at the tomb of the matriarch Rachel began special prayers at the site for Rabbi Yosef's recovery. During prayers kollel rabbis sounded the shofar (ram's horn) and circled the tomb site with a procession of the four species connected with the Succot festival, in accordance with a kabbalistic (Jewish mystical) tradition. According to Jewish tradition, the tomb of the matriarch Rachel, is an auspicious place for prayer.